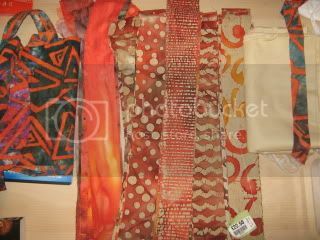 Whilst on holiday I bought myself what said it was a tan/orange/green batik jelly roll. I am salivating and today I allowed myself to open it. 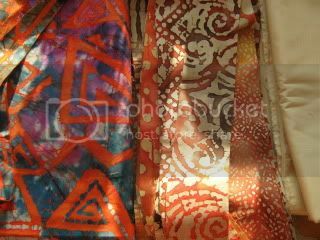 Well the patterns are different but the colours are not much across a tonal range. 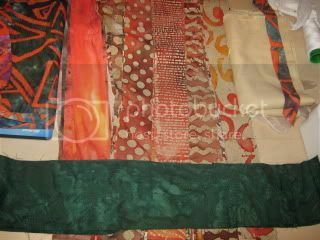 I bought some tan fabric to use for borders/sashing and so on and thought I would use the remains of my orange and green strong coloured batik as a contrast. As you can see the tonal range is not great and I feel the secondary patterns I like to find would get lost. 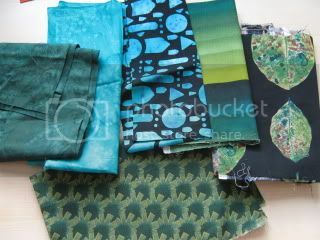 I added a dark green batik to see how that would look as a feature fabric. It helps but is is still a bit bland. 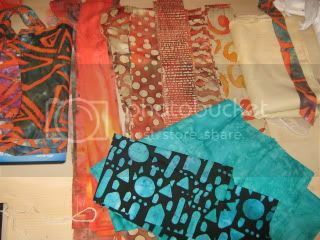 Remembering my colour wheel work I hunted until I could find the complimentary colour to orange, turquoise. Why I didn't think of this before I don't know as they are the two colours I love to paint in the most..
Now that does seem to make it sing. Any other ideas as to how I can give this a bit of oomph? I play on using this http://www.youtube.com/watch?v=7DFo-mIa ... plpp_video and using the small squares left to make a border. Colors are sure similar in tone aren't they? I love the addition of the dark green and turquoise. I think I'd try adding maybe one more dark cause you have lots of lights and mediums. A dark orange (sienna? Ochre?) maybe?? I remember one class I took talked about adding the next tone up or down for oomph. In looking at the pattern design, I see she has used 4 distinct colors, dark brown, red, green and white. You pretty much do have that in your selection, green, turquoise, oranges and a cream. It may be enough. Not speaking as a quilter but as what appeals to the eye - mine - it needs a dark brown and /or mustard yellow??? Good eye Lennie, either sounds like it would work! I was thinking dark brown until Lennie said mustard yellow. Now I agree with her, something light and something dark. You need a burger and some mustard with your bun, lettuce, tomato, and ketchup. Akkkkk! Not only do I work, eat, and sleep burgers......now they have wormed their way into my creative side too! thanks for the ideas, keep 'em coming. I am not allowed to start this until I finish the other one. Does that mean that because I have dreamt and sorted it becomes a UFO? I love the colors and mustard yellow would light it up. If the gold is right it might have the same effect. 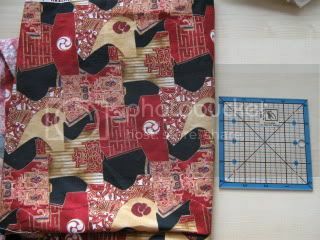 OK, I have had a rummage in the stash - the mustard yellow I used up in my oriental quilt - I knew I loved that fabric ( thanks Kath) but I have found a brown and mustard pattern fabric - Kimonos,top left of picture, and a red and gold top right. I am not convinced by the red and gold. Bottom middle is a mustardy green batik I have a few scraps of and bottom right another cream and green batik which jars a bit to me. The lemon yellow middle right, is the wrong tint I think. I think I am going to go with the orange and green, dark green, and the 2 blues as highlight colours and use the plain tan for a light along with the most lightly patterned of the strips. So would the strong pattern of the kimonos look out of place - or am I going to find it to be one of those serendipitous moments that lifts it out of the mundane to the fabulous? Going to have to try a few blocks I suppose...but I'll leave it one the bench for a while to brew and see what still looks odd in a few days time. 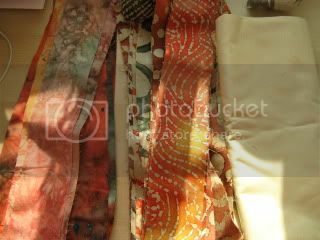 Besides - I still have to finish Jelly roll number 1! I agree with you Jan. The ones on the bottom don't really fit in. The red/gold I'm not sure, it seems really busy with all that fabric there. 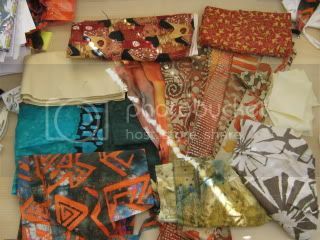 Can you do a pic with just the ones you want, and the kimono fabric. I'm liking the black touch that's in there, and it is going to be cut up, so you may not 'see' the kimonos as much. 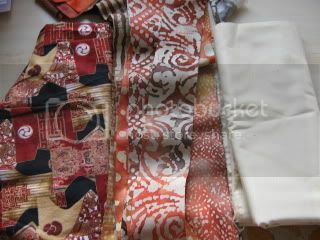 comparing the kimono fabric as the dark tones.